Today more than ever the arts are needed by our young people as a forum for safe expression, communication, exploration, imagination and cultural understanding. The overarching goal of the Tango Youth program is to address this need in the immediate, physical format of tango partner dance. We emphasize the skills of improvisation and encourage all students, both male and female, to learn both leading and following roles. We find this is an excellent tool not only for gaining a mechanical understanding of how the tango works, but also for instilling values of respect, empathy, and collaboration. 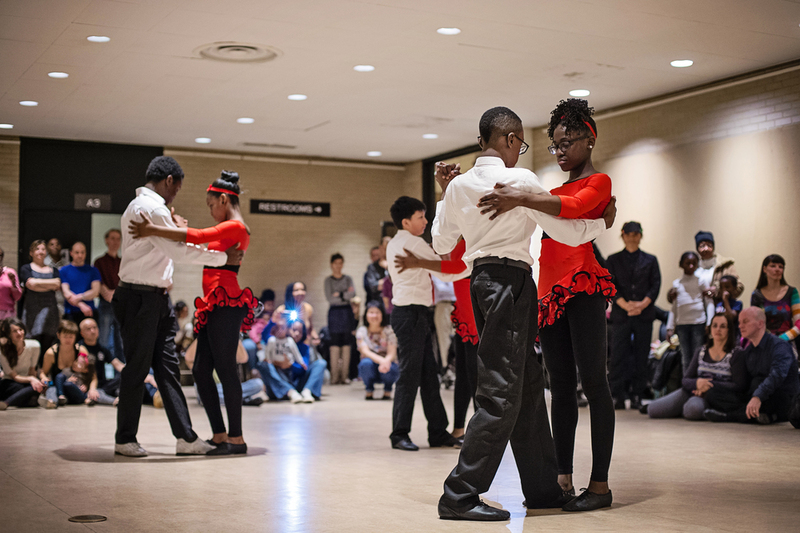 During the Summer of 2009, funded by a grant from the DC Commission on the Arts & Humanities, we taught twelve tango workshops to children ranging in age from 7-14 years old as part of summer camp programming at Dance Place and Joe's Movement Emporium. During the Summer of 2010, funded by a grant from the DC Children & Youth Investment Trust Corporation, we conducted a 6-week tango camp for teens in DC. We taught groups at five separate community centers in partnership with the DC Department of Parks and Recreation Summer Camps, culminating the program with a student performance at the ARC in Southeast DC. Four instructors, one intern, and five volunteers from the local tango community worked together on this project. In 2012 we piloted an 8-month after school program with KIPP charter schools in DC, culminating in a group performance at the Warner Theater. In the Winter of 2016, with the support of Kathryn Gandal, KIPP Charter School and Kathleen and Terry Golden, we ran a 10 hour "Tango Club" with a fantastic group of 6th graders. These young people had the rare opportunity to learn about the music, dance and history of Argentine tango. They learned the names and significance of quintessential tango figures that date back to the very beginnings of the dance with a view to transmit something of the original, historic Argentine tango. Each class incorporated the visiting (and revisiting) of important skills such as expressive movement, good posture and balance, and respectful, connected partnership. The program culminated in a live public performance to music played by members of the Tango Mercurio Community Orchestra at the Martin Luther King Jr. Memorial library in April 2016.